This might be Black Friday for you, but it’s a red letter day for me! 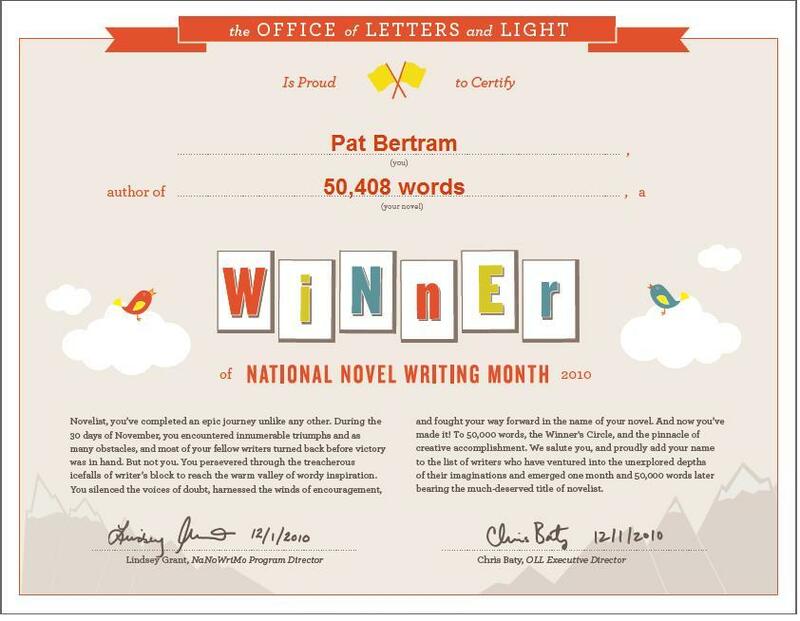 I actually wrote 50,408 words so far this month, which makes me a winner of NaNoWriMo. (National Novel Writing Month.) Although I already validated my entry, I’m going to continue writing the rest of the month because half of the challenge for me was to write every day in November. The final part of the challenge, digging for buried wisdom hasn’t happened — but I did find all those words, and that’s a major step for me. Haven’t written that much in years! Congratulations, Pat! That is so kewl. Wow. I’m impressed. Mostly because I doubt I could have done it. Bravo! Joylene, I’m impressed, too. Didn’t think I could do it. Oddly enough, it wasn’t difficult. I thought I’d be writing all day every day, but since I didn’t have to worry about writing well, I just wrote. Learned a lot about writing. Now I’ll just have to see if I can turn those words into a book. Congratulations, Pat! I know from first hand experience that it is a major achievement. I completed the 50,000 words last year, but so far this year I’m still a long way from reaching them. But I’m still puttering away. To me the biggest benefit of participating in NaNoWriMo is pushing myself to more than my usual daily amount and getting in an extended writing groove. I hope you’re finding that your writing time is taking your mind to fresh and interesting places, and giving a new focus to your days. you ripper Pat…couln’t help the aussie congrats. What an achievement…and all were cool to read! Fantablulous wordage Pat! Congrats! I had faith in ya! You make us proud. And I have no doubt that you will make it into a book. Congratulations – it sounds impossible to write 50,000 words in a month!